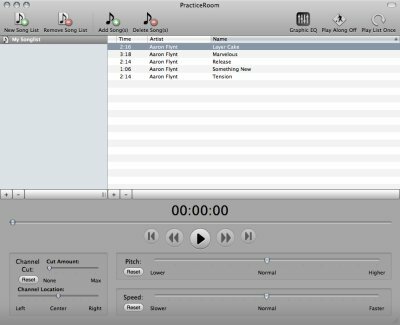 PracticeRoom is an iTunes like program for helping musicians learn songs. In addition to allowing you to organize music into lists, you can also change the speed and pitch of the songs as well as target and remove specific instruments from the stereo mix. Change the pitch of music. Change the speed of music. Remove selected instruments from the stereo mix. 31 Band graphic equalizer with preset for removing/isolating bass. Ability to repeat a song or entire song list. WARNING: This program has no expressed or implied warranty of any kind. Redistributing, modifying or selling this program without consent of the program author (me) is forbidden. 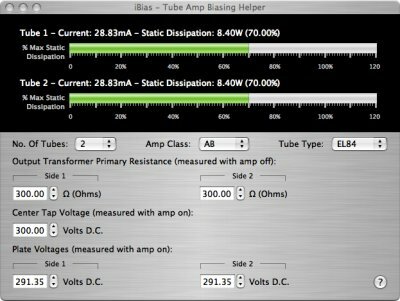 iBias is a tube amplifier biasing helper application. You take volt and ohm readings of your amp and iBias will tell you if your amp’s bias is too cold, too hot, or just right. You still have to know a bit about tube amps to use it, though. This is a an Apple Dashboard widget that I created in Dashcode.